Yes, the bobbins aren't full-full. 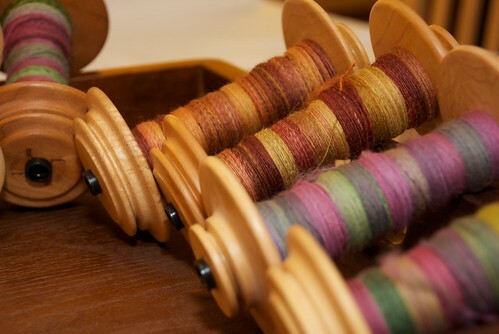 They all have about 1 oz of fiber, which needed to be photographed before I could get it plied up. Thanks to my photography lesson with the incomparable Jade, a little fiddling with my lighting, the settings on my camera, and using my sweet external flash yielded some pretty good results. So, I sat down to do some plying. I got busy and plied up the Crown Mountain Farms Blue Faced Leicester (from the Fiber of the Month Club), and I got to the end of one bobbin and realized that I still had 20ish yards of single left on the other bobbin. I've been listening to the Yarnspinner's Tales Podcast at night. Cindy has a lovely voice, and is probably the most articulate person I've ever listened to, when it comes to the technical side of knitting. I'm listening back from the beginning, and in one of the episodes, she talks about Andean plying. For the first time, it really clicked. Basically, you make a center-pull ball around your wrist, and then ply from both ends. In watching a video on how it's done, there are flashier ways than simply wrapping your wrist with single, but Cindy's description yielded some pretty spectacular results for having done it sight unseen. (You can see a YouTube video of the "right" way of doing it here.) I'm also super-pleased with myself for learning a new spinning skill. My real motive for feeling the need to clear out bobbins? 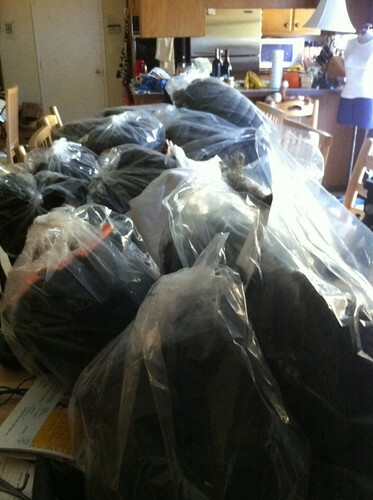 That's right, this is what 20 lbs of clean fleece from Morro Fleece Works looks like. My table? Not as spectacular. My fleeces from Black Sheep Gathering 2010 have started arriving. They're big, beautiful, and demand to be spun. Just like that disc of Mad Men demands to be watched. Coincidence? I think not. Yowza! That is a lot of fiber. Your singles are lovely. I do not spin but love to watch what other people make. I can't wait to see it plied. LOL, that's what my "guest room" looks like. There's only one thing BAD about the bags arriving from Sheri... and that's the bill that comes with it! We could do a pin drafted roving exchange... I have beautiful Cormo from Sue Reuser, who consistently wins at the shows, then there is gorgeous colored merino from Humble Hills, some wonderful soft grey Romney, and some fabulous silvery Corriedale from my two sheep at Whitefish Bay... all given that special Morro Fleece Works touch. Whatcha got? LOL. I prefer to use my 'fake hand' to do the Andean plying, so when people like ME call YOU on the phone, can lay the 'hand' down. LOLOLOLOL. Where have all the knitters gone?